Between the kids, the dogs, the cats, the rescue dogs & cats, and my husband, my housekeeping skills get tested on a regular basis. We try to use natural products whenever we can, and I’ve found that for carpet & clothing, I really only need a few things for every mess (and you’ll be surprised how inexpensive it all is!). I’ve learned these tricks to save rugs & upholstery, but have found that they work in a crunch on clothing as well. Always test any of these methods in an inconspicuous location! Hydrogen Peroxide. Chemically neutralizes blood, urine (even cat urine! although, you have to get every. single. molecule. ), and other organic materials. 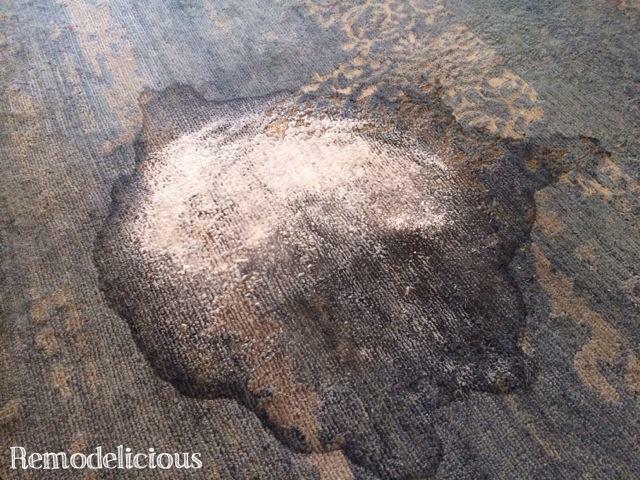 When people see me dump a bottle of hydrogen peroxide on my gorgeous Persian rugs, they usually gasp. We know it as hair bleach from long ago, but those gals made it into a paste and used heat. Seriously, I keep a spray top from an old sprayer on a bottle of peroxide to clean up after our kids and pets quickly. How to use it: Use a towel to absorb as much of the mess as possible, stepping on it works great. Then pour on the peroxide. The trick: Leave it alone! Your instincts tell you to rub and bot it up, but don’t. Walk away and let it do it’s work. Of course, always do a test spot (although I’ve never had anything react badly, even on new & 100+ year old Persian rugs.). Folex. I hear tricks about blood and red wine all the time… everything from milk to swearing at it. Just spray it with Folex and walk away! Works great on carpet stains as well, like when your adorable daughter pours a full cup of apple juice on her bedroom carpet. I buy ours at Bed, Bath, & Beyond (don’t forget your 20% off coupon), although I’m seeing it more and more places these days. For some stains, Hydrogen Peroxide works better, for others, Folex. You can buy it online here. Oxygen Bleach. Works similarly to Hydrogen Peroxide, but this is for serious stains (like the one below). The ingredient in particular you are looking for is sodium per carbonate. It’s found in Oxy-Clean and store-brandlaundry boosters. Even Ajax makes one. It’s made with Baking Powder & Hydrogen Peroxide and releases oxygen when water is added which is what grabs the stain molecules in the carpet. How to use it: Mix it with water, pour it on the stain, let it sit for 30 minutes, bot it up, pour on water to rise, and bot it up again. It’s hard to let a horrible stain sit while the Oxygen Bleach works it’s magic, so walk away and do another task for the 30 minutes! You can but it online here. Bonus: Vinegar is also great to keep on hand. I rarely use it on rugs & fabrics, but it can occasionally be handy (see below). It is great to use on counters, in bathrooms, in the dishwasher, and many other places. That’s literally all I need to clean the worst messes! Of course, always to a test spot first just in case. The trick with all of these is to let them sit to do their work. With synthetic dye that you might find in drinks & candy (like below), you’ll need to rinse the dye out after the cleaner breaks the dye away from the fibers. My kids were sick recently and we our 3 year old have a bit of Gatorade. We never let our kids have stuff like that, and of course the first time we ended up with a serious situation. After rushing out in the morning, I returned home to pick up and found this mess under a towel that my husband had thrown it. Apparently child 2 had knocked over child 1’s cup and hubby chose to hide the mess rather than dealing with it. Instead of digging a large hole for him in the backyard, I first tried my trusty hydrogen peroxide, letting it sit first, and then Folex when the stain was still there. Here’s the problem: Gatorade (and many other treats) have dye in them to make them that fancy color. Since it had dried, the dye was now a part of the one Persian rug I bought new (and paid too much for because it was love at first sight). The next step was to run out for some sodium per carbonate (Oxygen Bleach). Here it is at work. It bubbled up on the stain while it worked. Pretty cool, huh? And I didn’t wast my time and money on “carpet cleaners” made by companies that spend more money on marketing than their product. Some of the best products in the world are natural and you don’t hear about them because they can’t be patented and sold at a premium. Step 3, all clean! Catastrophe averted, husband can live to make his next mess. It’s still a little damn, hence the splotchiness, but I wanted to get this posted. 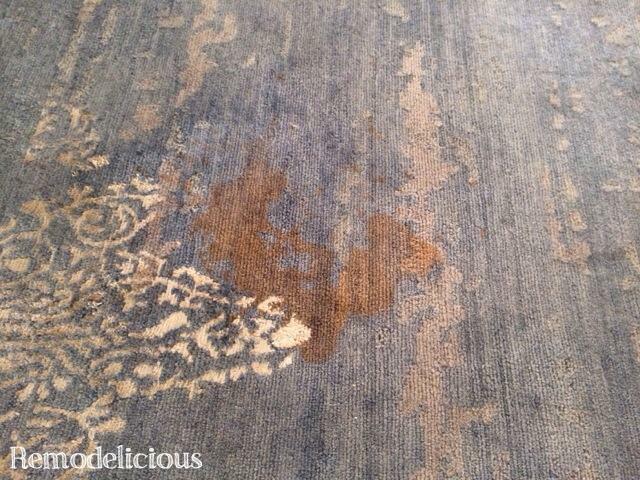 I mentioned above that occasionally (once in a blue moon) I also use vinegar for cleaning my rugs. After rinsing the oxygen bleach above, there was a ring left over where I had cleaned. This is a heavy traffic area and I’m sure that the oxygen bleach loosened some additional dirt and grime that wasn’t visible before, leaving a ring when it dried. I sprayed Folex on the entire spot again, then some diluted vinegar, gently worked it in, then poured water on to rinse. To get everything back out, I put down a couple of our “rag towels” (old towels that have been retired to the laundry room for bathing dogs & cleaning up big messes) and stepped on the towels to draw the water and everything else out of the rug and into the towels. Hydrogen Peroxide can also be used as a household cleaner. It naturally cleans & disinfects! I originally discovered it’s magical powers when we discovered that our cat wasn’t letting a foster cat use the litter box (yuck!). We bought an expensive bottle of magical cleaning solution that the folks at our local mom & pop pet store swore by, only to find out later that it’s Hydrogen Peroxide at a slightly higher concentration. It is truly magical + cheap! Folex is sold as carpet cleaner, but it works great as a pre-treater for blood & red wine stains for your laundry. A friend’s fiancé once knocked an entire glass of red wine on a white cashmere sweater I was wearing. She nearly broke up with him over it, but now they are married with 3 kids and I still have that sweater! Oxy-Clean & other oxygen cleaners are usually sold as laundry boosters, but work great as carpet cleaner and even a grout cleaner. Even I thought all might be lost with this awful gatorade stain, but sodium per carbonate cane to the rescue! It’s all about the chemical reactions. Why wash a stain when you can break it apart chemically? It’s safer for our family, pets, and the environment PLUS it’s much less expensive and we are storing fewer “specialized” cleaners. For more on cleaning persian rugs, recently found this web page with other cleaning suggestions. I’ve never had to resort to these heavy chemicals. Nail Polish – My daughter did once knock over some nail polish onto the same blue rug above and nail polish remover & Goof Off got the nail polish out. Then I cleaned the chemicals out with a water rinse & towel dry). Dog & Cat (& Kid) Urine – We keep an inexpensive black light when we have trouble finding a smell. We have this one, but there are many options. You will probably need to wait until it is completely dark at night to use it, but it can find this tricky smells. To get rid of the smell, you have to neutralize EVERY DROP. So, if you’ve missed just one little spec, the smell will still be there. We’ve tested this on all of our rugs and carpet… We now get as much of the mess up as we can by stepping on a towel on the spot, then pour/spray on Hydrogen Peroxide and let it sit. I also clean poo spots with peroxide and a rag since it cleans & sanitizes. Harsh toxic chemicals in cleaning products are a bad idea. I always recommend using steam or at least eco friendly cleaning products to all my friends and family when it comes to cleaning their homes. I’m glad I’ve found somebody who appears to agree with me. Nice post, some great before and after images and a lot of very valid points throughout.